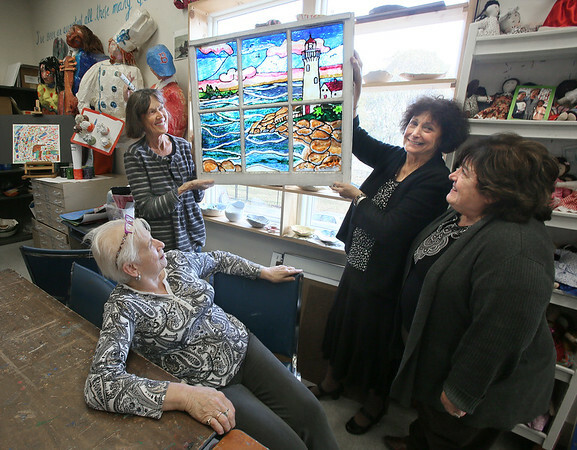 Judy Magee looks up as her recently completed painted glass window is held up to the light in the art room of the Rose Baker Senior Center by Juni VanDyke, left, director of the art program at the center, and Lucy Sheehan, executive director while Lydia Bertolino, left, looks on Thursday. The window was one of 60 donated for artists to paint on. Magee's work and others will be offered for sale during the Holy Family Parish Christmas Fair on Nov. 18 in the parish hall of St. Ann's Church.